We strive to serve you the best possible service. SIMILAR TO PHOTO. 100% Quality tested & cleaned. Genuine Sony. Black in Colour. Dark Grey in Colour. Genuine Sony. FOR THE PLAYSTATION 2. Platform Sony PlayStation 2. Model PlayStation 2 - Original. Exterior Color Silver. Color Black. Buttons not working, not been recognised by console etc. PlayStation 2 2x units for parts / not working. 2x White Wii remotes. We are very proud to say we haven't had a faulty product to date. For parts and not working. One with a rattle and stuck in top buttons. 7x PlayStation 2 Controllers Black Clear & Silver - For Parts Only Not Working. Condition is For parts or not working. Sent with Australia Post Standard Service. New and in a Factory-Sealed container. All TESTED. Although it is second - hand goods, the professional is maintenance and cleaning. 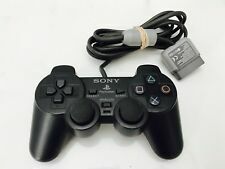 Original OEM Sony PlayStation 2 PS2 Controller Dualshock Black SCPH-10010 Tested. Excellent Condition . Shipped with Free USPS First Class Package. See pics for details. If you have any questions please ask. Thank you for looking. Happy Shopping!! DUAL SHOCK 2 CONTROLLER OEM PLAYSTATION 2 PS2 SEALED PACKAGE NEW Black Sony. Brand new never opened. Controller has been in original packaging. Please look at pics as by the buttons it showing the plastic swelling. Selling as is / untestable (original clam shell case unopened. Same day shipping!!! 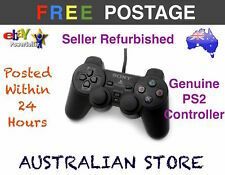 4.5 out of 5 stars - DUAL SHOCK 2 CONTROLLER OEM PLAYSTATION 2 PS2 SEALED PACKAGE NEW Black Sony. 29 product ratings29 product ratings - DUAL SHOCK 2 CONTROLLER OEM PLAYSTATION 2 PS2 SEALED PACKAGE NEW Black Sony. This is the original (OEM made by Sony), NOT the cheap imitations floating around. Use it or save as a valuable collector's piece. Good preowned condition. Tested and working. RARE Official Sony Playstation 2 PS2 DUALSHOCK OEM Controller White collectible. Condition is Used. Shipped with USPS First Class Package. PlayStation 2 Controller Green OEM PS2 DualShock Translucent Condition: Pre-Owned Good working condition. Minor scuffs from use. Compatible with PlayStation 1 & 2. Genuine Sony manufactured part. This policy has only been included due to the amount of collection requests i get and have to reluctantly refuse. You will receive your item much more quickly and also help show your support. It has been tested and is in working condition. Thumbsticks are also in good condition. Photos shown are of actual item. Lot 2 Original Sony Playstation 2 Dualshock PS2 Controllers SCPH-10010 Analog. Condition is Used. Shipped with USPS Priority Mail. Fully tested & operates perfectly. PlayStation 2 Controller Blue OEM PS2 DualShock Translucent Condition: Pre-Owned Good working condition. Minor scuffs from use. Trending at AU $22.01eBay determines this price through a machine-learned model of the product's sale prices within the last 90 days. Sony PlayStation 2 PS2 Dual Shock II Black Controller OEM Original Official. Condition is Used. Shipped with USPS First Class Package. Two Original Sony Playstation 2 PS2 Controllers SCPH-10010 SCPH-1200. Show some dust/dirtiness - ships fast and free! Thanks for looking, have a blessed day! Disc tested and verified, No ErrorsOverall good condition, unit has been tested and no faults found. All CDs and DVDs are checked and tested for playback and errors. We will do our best to ensure the best savings for you.